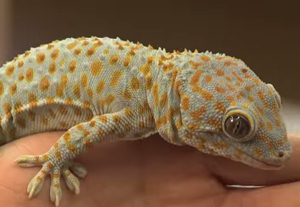 A team of scientists at the University of Massachusetts (UMass) has developed a reusable adhesive inspired by the adhesive toe pads of geckos that enable them to climb up walls. Led by Duncan J. Irschick, PhD, professor of biology, and Alfred J. Crosby, PhD, professor of polymer science and engineering, the team has published "Creating Gecko-Like Adhesives for 'Real World' Surfaces" (DR King, et al.) in the journal Advanced Materials. Irschick and Crosby say that it's not about inventing a new material, but about making old materials perform in new ways. In an interview with The Guardian's Leah Borromeo, they said that Geckskin is made from nylon, bathroom caulking, and carbon fiber or cotton. "We aren't creating a new material that requires some crazy nanotechnology and is going to cost millions to produce," said Irschick. "The creation is simple in its conception and profound in the way it's put together." According to Geckskin's UMass website, "Unlike traditional pressure-sensitive adhesives, which rely on viscoelasticity for adhering to surfaces, Geckskin relies on a concept known as draping adhesion. Draping adhesion is created with materials that can drape to create conformal contact with a surface while still maintaining high, elastic stiffness in directions where forces will be applied. This design enables adhesive loads to be more evenly distributed across the pad surface, while also allowing for a rapid and low-energy transition between attachment and detachment." The key innovation of Geckskin, the scientists say, "was the integration of a soft elastomer (the pad) with a stiff fabric (the skin), allowing the pad to drape over a surface to maximize contact. Further, as in natural gecko feet, the skin is woven into a synthetic tendon, yielding a design that plays a key role in maintaining stiffness and rotational freedom. The end result is an adhesive device that is powerful, easily removed, and leaves no residue." Crosby says the idea for a super-adhesive first got funded by the National Science Foundation, then the research received further money from the Army's Defense Advanced Research Projects Agency (DARPA). Refresh your medical device industry knowledge at MD&M East, June 9-12, 2014 in New York City. Regarding the future of Geckskin, Crosby told Borromeo, "Recently, we've made Geckskin out of 100% renewable resources--natural fibers as well as natural rubber--and still have high performance. Our way of looking at it is that now we can eliminate waste though extended wear as well as use renewable resources to make it." Although there has been great commercial interest, they say, they have at least a year until they have something ready to go on the market.